Gaming chair company Secretlab has set its sights on new pastures. Launching its first offering in 2015, the Singapore-based startup has shown a remarkable willingness to iterate and improve, launching no fewer than three generations of chairs in three years. However, the company’s latest offering doesn’t have anything to do with gamers. The NeueChair, the first product from Secretlab’s new subsidiary Neue (pronounced noy-yuh), is aimed at professionals who demand stellar levels of comfort and support from their chairs to help them focus better. The NeueChair is a mesh chair for the office, and it probably reminds you a lot of chairs from Herman Miller, such as the reknowned Aeron. At S$1,149 for the Obsidian version, and S$999 for the Silver, it seems like Secretlab is, in fact, going after customers who’d otherwise be looking at a Herman Miller, and trying to lure them away with a slightly more palatable price. Before you chastise me for calling the S$1,149 price tag palatable, bear in mind that a similar chair from Herman Miller costs upwards of thousand five hundred dollars (though you could get it less without any added options), so I’m talking in relative terms here. The big question here then is whether or not the NeueChair is good enough to stop you from ponying up for a Herman Miller. As it turns out, the NeueChair is actually pretty good. It’s a solid first offering from a company that has so far catered solely to an entirely different audience. You get a bunch of different adjustments that you wouldn’t otherwise get with a gaming chair, such as the ability to tweak the height of the lumbar support, seat depth, and how forward the backrest is. The chair also feels kind of cool to sit in, and the fine-grained controls really made me feel like I had all the tools I needed to get comfortable. For starters, both armrests come with levers under them that work different parts of the chair. Squeeze and hold the lever on the right, and you can immediately adjust the height of the chair. I like this feature a lot, as it saves me from having to reach under the seat for the traditional lever. The left lever controls the recline lock and you just squeeze it to lock or unlock the backrest tilt function. When unlocked, you’ll be able to lean into the backrest and feel it tilt back. Unlike the tilt feature on the Secretlab Omega, the seat on the NeueChair doesn’t move, and it’s only the backrest that tilts. 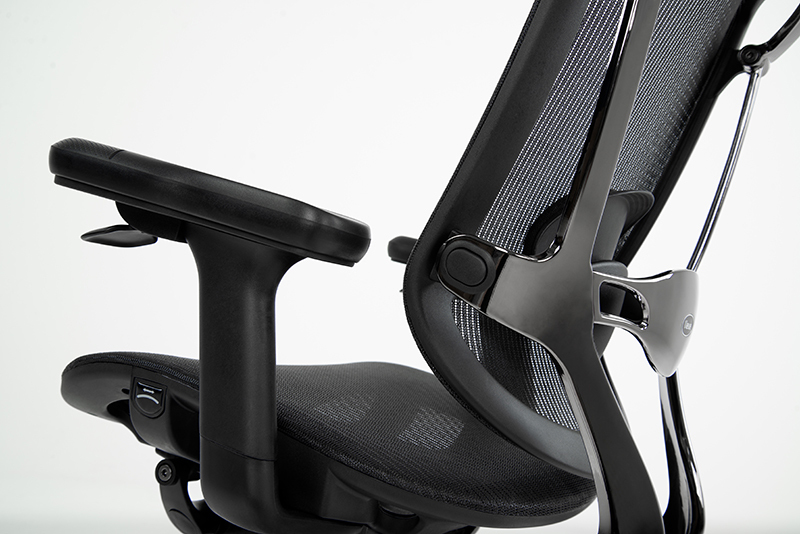 That’s a key difference between a chair geared toward productivity and one designed for maximum comfort. After all, you don’t want to be staring at the ceiling when you’re trying to get some work done. You can also adjust the amount of recline tension using the knob under the seat. Rotating it clockwise increases the resistance, while rotating anti-clockwise decreases the resistance. I personally preferred lowering the resistance, but your mileage may vary. The armrests themselves can, of course, be adjusted as well. You can adjust their heights or pivot them from side to side, a process that I found to require quite a bit of strength. 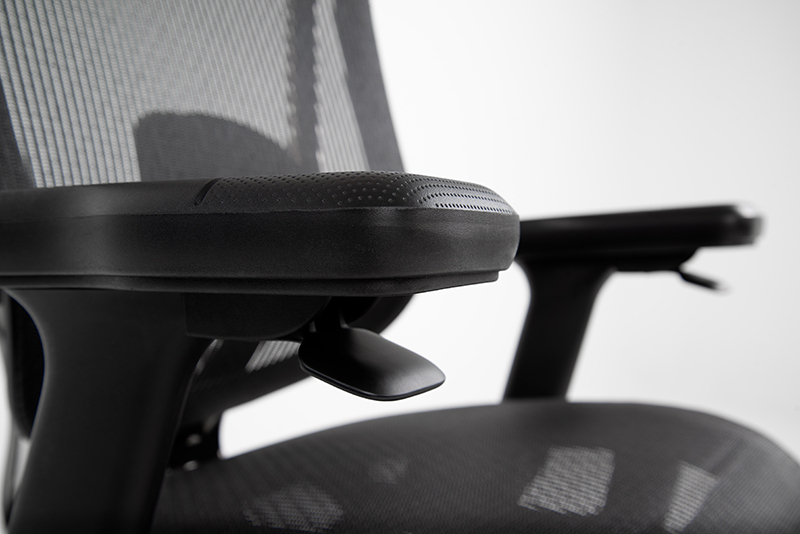 The armrests are PU-coated, and they feel plush and comfortable enough, even after long hours. They’re more textured and wider toward the front as well, a tiny bit of detailing that I appreciate. 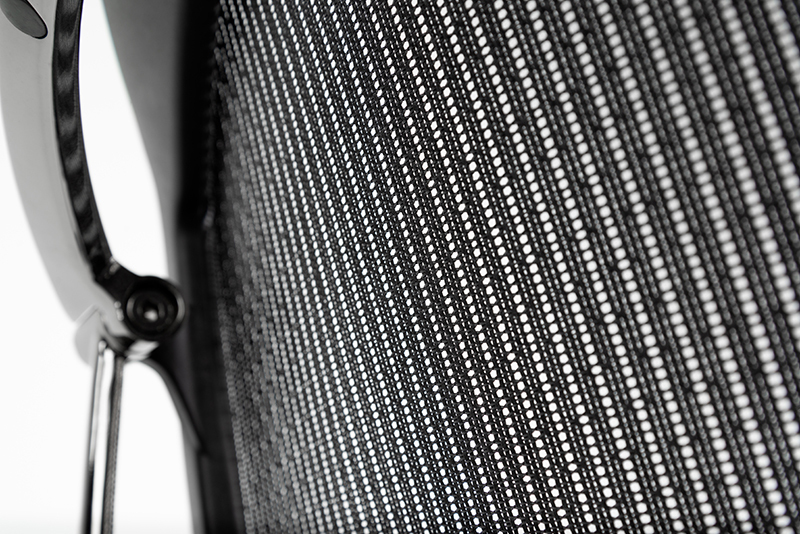 The chair uses a mesh material that Secretlab calls NeueMesh. It is a three-layer mesh blend woven from top-grade polyester fibre and DuPont yarn, designed to offer both durability and comfort over long hours. I obviously haven’t used the chair long enough to comment on how it’ll hold up over the months and years, but it sure looks like it’ll do just fine. I think the mesh manages to find the right balance between density and breathability, so it’s overall pretty well done. However, there’s a slick feeling to it that feels distinctly like plastic, and I’d have preferred something that felt a little more like fabric. 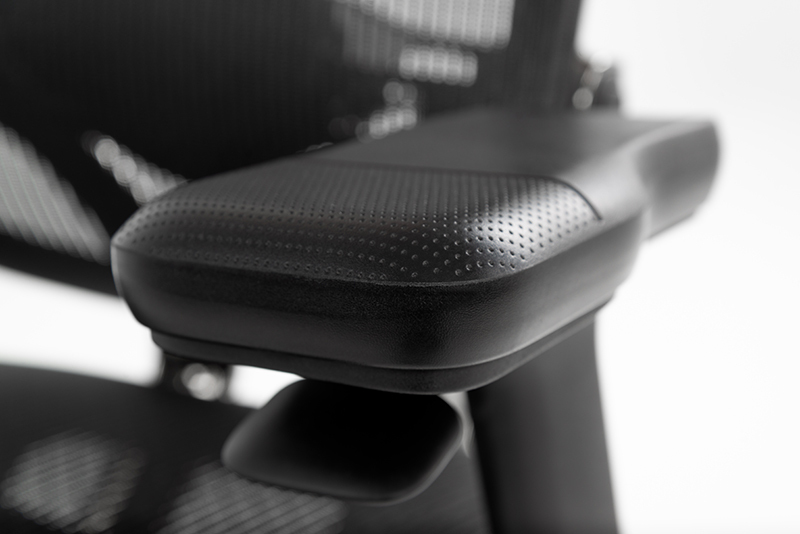 The core of the chair comprises an ADC12 aluminum alloy frame, a metal Secretlab says it picked because of its great tensile strength and lightweight properties. The frame follows sleek, flowing lines at the back of the chair that give it a fairly modern look, but I’d have preferred if the Neue logo wasn’t there. I also mentioned earlier that there are two variants of the NeueChair – the Silver and the more expensive Obsidian. The difference lies in the treatment of the chair’s frame, where the Obsidian boasts an additional layer of industrial chrome plating for better durability and corrosion resistance. The chair also uses a Class IV hydraulic piston from SHS, which Secretlab says has been further reinforced by carburizing. I have to admit that one of my concerns when I saw the shiny chrome plating was whether or not it would end up chipping and peeling in the long run, but Secretlab says that this shouldn’t be a problem. That said, I’m still not a fan of the glossy look, and I think it detracts from how premium the chair feels. The next two adjustments you can make are probably the most finicky. 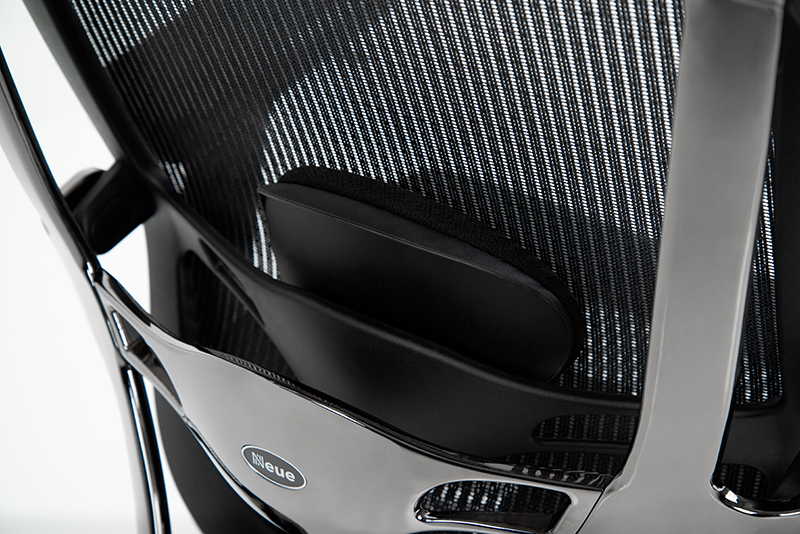 You can adjust the lumbar support depth, or rather how forward the backrest sits, by pushing the buttons on both sides of the backrest and pulling or pushing the frame to suit your preference. This was frankly my least favorite part of the chair. You’re meant to use your index and middle fingers to push the buttons, while your thumb handles the adjustments. This makes sense, but the mechanism isn’t as smooth or easy to work as I’d like. And woe be you if you’re like me and don’t possess enough strength in your left thumb to work it reliably. 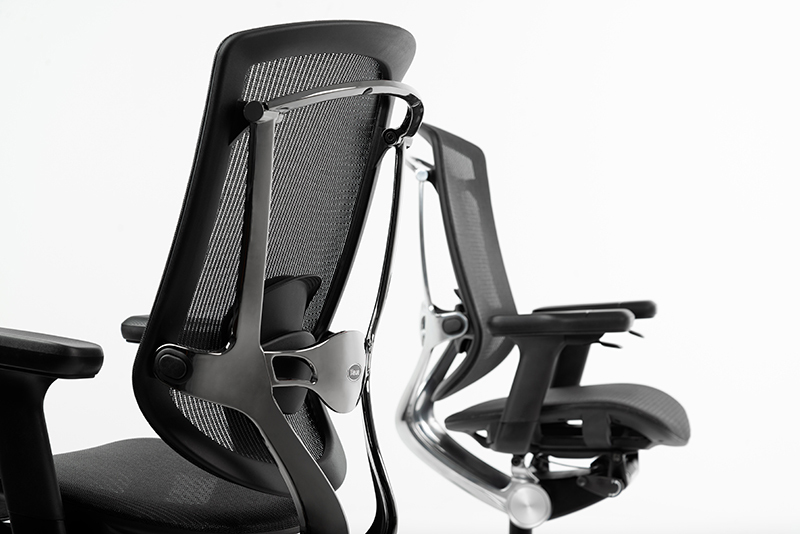 In comparison, most office chairs tend to use a dial on the chair's side to adjust lumbar support, so this adjustment style adopted by Neue can seem awkward. Thankfully this is generally a one-off adjustment that you don't have to make frequently. The lumbar support height is easier to tweak, but you’ll have to go around the back of the chair for this. You pull or push on the supporting piece to get it to your desired height, and while it works simply enough, the one downside is that you can’t easily do it while sitting in the chair. The good news is that the lumbar support does its job pretty well, and I found that it provided better support for my lower back than the already excellent memory foam pillow on the Secretlab Omega. I’ve always had the feeling that the cushion on the Omega didn’t reach high enough, but with the adjustable lumbar support, I’m able to get it to just the right height. Finally, you can shorten or lengthen the seat depth by pushing the button on the left of the seat. You can do this while seated by sliding forward or backward, and it’s overall pretty convenient. A longer seat depth can better accommodate taller people as well, but since tall I am not, I preferred the shortest setting since it forces you to sit in a more upright position as well. Plus, because of my small frame, I could even consider sliding the seat out to afford myself more room and sit with my legs crossed on the chair. Overall, I’m pretty happy with the NeueChair. It does what it's supposed to do, which is support my back wonderfully. It's not perfect -- some of the adjustment mechanisms don't feel as smooth or refined as they could be -- but they do work. The NeueChair reminds me in some ways of the first Secretlab Throne. A little rough around the edges, but still really functional. Secretlab has proved that it knows how to make excellent chairs with its newest creations. If this is its first outing into mesh chairs, I'm only looking forward to what it'll come up with further down the road. Is the NeueChair Obsidian really worth S$1,149? My instinctual response is to say no. But I’d also say the same for any Herman Miller chair, or any other ergonomic chair that's charging similar prices. However, before you scream that you can get a mesh chair from IKEA at a fraction of the price, I'd argue that the NeueChair does try to justify its price with a range of adjustments that you'd usually find on much more expensive chairs, and most of the adjustments work nicely too. 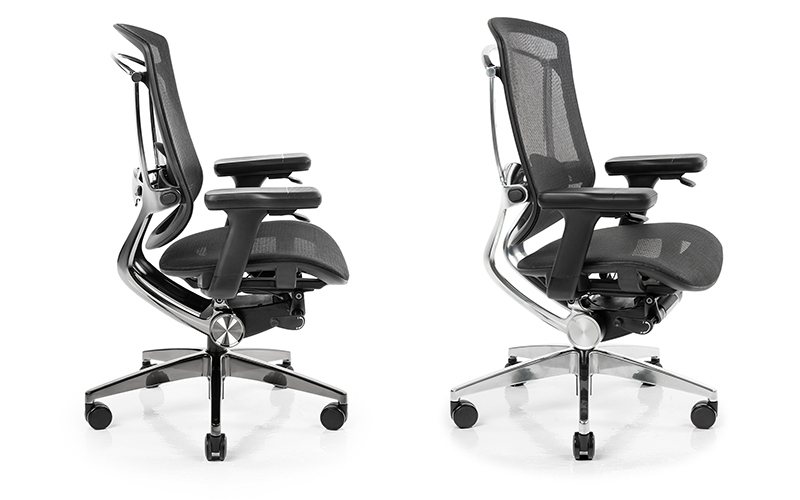 Having said that, you'll be interested to note that the NeueChair Obsidian and Silver are actually currently being 'offered' at S$899 and S$799 respectively. Having experienced how Secretlab has priced their existing Throne and Omega chairs, there's a good chance that these 'offer' prices will likely be the normal price. If so, the NeueChair's asking price is somewhat reasonable for its class, build, finish, support and functionality. By no means is it affordable, but it is justifiable. Is there anything more I could ask for? A headrest extension perhaps, but I'm hoping more versions of the NeueChair will come along to rectify this. 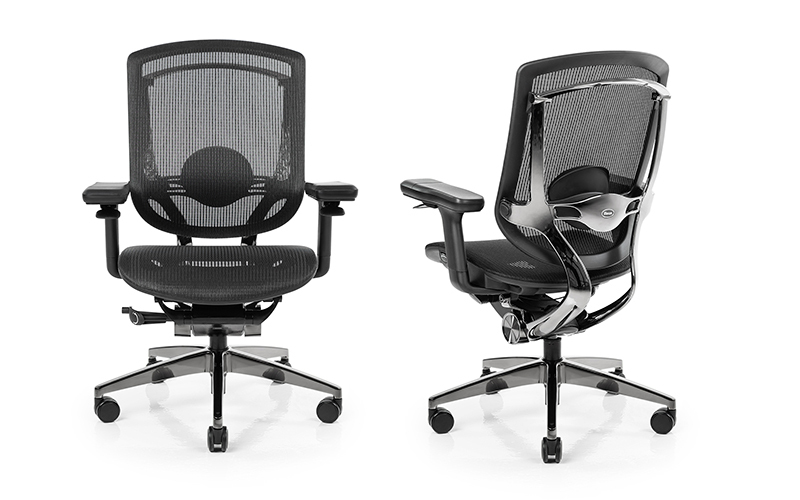 For now, if you're looking for an ergonomic, mesh chair, you won't really go wrong with the NeueChair. Oh, and it's backed by a 12-year warranty, so your investment will be protected for pretty long.